India Song – a 1975 French film directed by Marguerite Duras. It has been some years now since I last visited the world of Marguerite Duras. I love her work, and look very much forward to a new visit into her unique universe. Emmanuel Hocquard: A Test of Solitude. Emmanuel Hocquard (born in 1940 in Cannes) is a French poet who grew up in Tangier, Morocco. Steve Evans says: Emmulating Wittgenstein, who repaired to an isolated cabin in Norway to write and reflect, Hocquard takes up his own test of solitude on a farm not far from Bordeaux. What he writes there are unconventional sonnets that arrive at their stipulated line-count by an ingenious variety of means. They record with deceptive simplicity daily accounts and experiences. At the same time, an inquiry is being conducted, a test of solitude that is also a test of poetry. Marcel Bénabou: Why I Have Not Written Any of My Books (in Swedish: Varför jag inte har skrivit någon av mina böcker). I did some Ouilipo reading last year, very much looking forward to reading more. 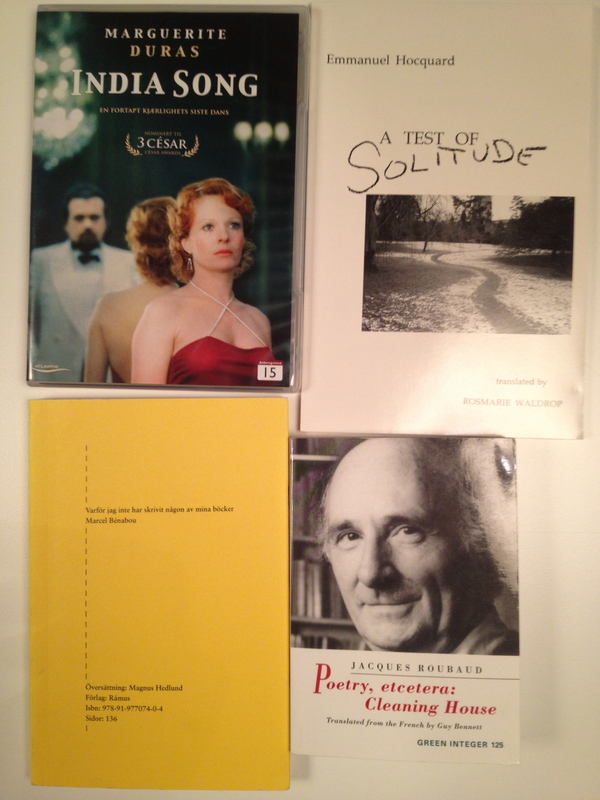 Jacques Roubaud: Poetry, etcetera: Cleaning House. Jacques Roubaud (born 1932 in Caluire-et-Cuire, Rhône) is a French poet and mathematician. In Poetry, etcetera: Cleaning House he asks: What is poetry today, and how does it fit into our daily lives? Through a series of intelligent and personal, often humorous essays Roubaud explores the role of poetry and poetry means to us. … I do not know Roubaud’s work, but this sounds just like something I would love to read! Blessed by Christmas in February! Wow, that’s one hell of a gift. Makes me wish I knew people who give books as gifts. You might be interested to know (if you don’t already) that the Hocquard is also available in Norwegian. En prøve på ensomhet translated by Jørn H. Sværen and published by H Press. Oh, by the way, if you’re still looking for good nature writing, bookdepository.co.uk are selling a hardcover edition of Richard Mabey’s Weeds: How Vagabond Plants Gatecrashed Civilisation and Changed the Way We Think About Nature for 7 Euro these days. Nature writing – yes! Thank you for the bookdepository tips. Will you be reading Roubaud in Norwegian? I’m a big Marguerite Duras fan; have watched several of her films during the course of my graduate program! This is actually one film I didn’t know about! The books are wonderful, too. My friend had been searching for this film for a long time, and when she finally found it she bought one for me as well. The first Duras piece I ever read was “Moderato Cantabile” – its still an absolute favorite of mine. In the not too distant past–mid-January–a friend and I celebrated Christmas, both having had one thing or another going on during “the season.” A bag of books and a winter’s mug were my gifts from my dear friend; mug and book titles told me she hears not only what I say but what I do not. I am glad you, too, have such a dear friend. Happy reading to both of us.